Gary Neville (born 18 February 1975) is an English retired footballer. 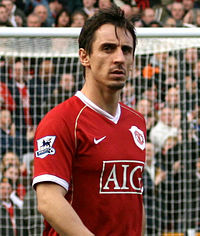 Neville played for English club Manchester United during his whole career, and was captain of the club. He has also played for the England national team. Neville was the head coach of Spanish team Valencia CF from 2 December 2015 – 30 March 2016. His brother Phil Neville is also a footballer. ↑ Strack-Zimmermann, Benjamin. "Gary Neville". www.national-football-teams.com.